Congress returns today after the midterm election with a lot of work to do in a short amount of time. 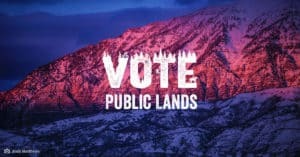 On Election Day, across the country, hikers and outdoor enthusiasts sent a loud message to elected officials to #VotePublicLands. Your efforts paid off. Members of Congress across the aisle voiced strong support to protect public lands that looks to get only stronger in the next Congress. However, there is still unfinished business for the current congress. With just a few weeks remaining before the end of the session, three major bills impacting public lands and trails, all with overwhelming bipartisan support, need to cross the finish line. The LWCF, America's most important conservation and recreation program, has protected, preserved, and expanded the places you love to hike in nearly every state and every county in the U.S. for 50 years. On September 30, the LWCF expired, placing at risk the construction and completion of trails. House and Senate committees have considered and approved bipartisan bills to reauthorize and fund the LWCF (H.R. 502/S.569), and congress must pass these bills into law immediately. Both the House and Senate have passed funding bills inclusive of trails and outdoor recreation programs (H.R. 6147) that are awaiting a final vote to resolve differences between them. If Congress doesn't act soon, these funding gains could be lost. Our public lands are facing a $21.1 billion backlog to maintain trails, roads, bridges, and buildings. When annual maintenance needs go unaddressed, long-term problems arise, seriously hampering the public’s access to outdoor recreation. Closed trails, out-of-service restrooms, campgrounds in poor conditions, and impassable roads are only a few of the barriers that hikers face. Congress is moving forward with strong bipartisan effort and the support of the Trump Administration on two bills (H.R. 6510/S.3172) to address these maintenance needs. The House and Senate committees have approved the legislation, and now it awaits a floor vote by all members of congress. With all the progress that has been made on these crucial pieces of legislation, Congress must not leave before it completes this work. Join us in telling your representative to protect public lands!